Popcorn texture or acoustic drywall texture is applied to the ceiling and can be the best way to hide finished drywall defects. Popcorn texture is mixed with water to expand small chips of polystyrene, allowing the drywall to look like cheese or popcorn. Popcorn textures have Styrofoam as well as other materials added to the drywall mud mixture to create the puffy appearance. A large nozzle is used on the spray gun to spray popcorn texture because of the "popcorn" in the mud. It was one of the most used forms of finishing during the 1970’s and could be easily applied. Popcorn texture is really hard to remove, so if you plan to apply it and remove it later, think it twice. People are usually more interested in removing this type of drywall texture from their ceilings than they are in a new application. Acoustic popcorn textures sprayed before 1978 are very likely to contain asbestos. Materials containing asbestos must be removed only by a trained and licensed professional. Begin by scraping the popcorn texture, to remove the painted layer. After the paint has been removed, apply water to the texture to soften it. Popcorn texture in its natural state will absorb water and will be easier to remove the texture. Scraping popcorn texture will generate dust, so be sure to cover or remove all furniture from the room. If the room has carpet flooring, cover it with a plastic barrier and craft paper over it. There are specific products on the market to be placed directly on the carpet and will serve as a plastic barrier. Once all the texture has been removed, a new finishing surface could be applied. Be careful when removing popcorn texture and try not to scrap the drywall surface, where the popcorn was applied. If the surface has been altered be sure to patch it before applying other drywall finish. If removing the popcorn surface creates you additional problems, you might want to install a new layer of drywall over the existing texture, but be sure to use screws long enough to penetrate existing surfaces and penetrate in the rafters or joists. Spraying popcorn texture requires the use of a special texture sprayer. The texture covers the entire surface with a thick layer, therefore, it will cover many imperfections in the drywall finishing. Cans of spray texture have written on them the recommended coverage rates however you may want to estimate more material as these cans usually do not cover quite as much as expected. Fill and patch any imperfections in the surface using spackle and then apply a coat or primer with a roller. The primer should be allowed to dry for at least four hours. Prepare the surface and the room where the surface will be applied by covering wall, floors, and furniture with plastic sheets or drop cloths. Wear appropriate Personal Protective Equipment (PPE) before applying popcorn texture. Mix the product that is going to be applied. Mix inside a big pail using a paint mixer attachment to achieve a nice blend. The mixture is ready when it's the consistency of thick porridge. Fill the equipment going to be used and start the compressor. Practice by applying to an old piece of drywall to see how it might look. Spray the mix on the ceiling and keep moving the nozzle to avoid oversaturating the area where the mix is being applied. Use multiple light coats and allow the texturing time to dry between coats. If you spray the texture on too thickly, it will drip off the ceiling. Once the texture is applied it may be painted using an airless paint sprayer. 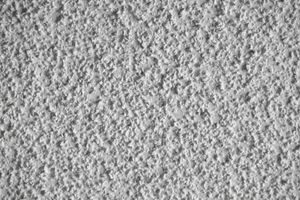 If you decide not to use Popcorn drywall texture, be sure to look at Santa Fe texture or skip trowel texture. These two textures might be the ones, accepted as substitute textures and are widely used among construction professionals. However, there are several other textures that you should consider and analyze before selecting popcorn texture.